The Hahnfels tour begins at Belmontplatz in Erfweiler. After the ascent to the Hahnberg with the Hahnfelsen a fantastic view over the Wasgau reveals itself. Here is the suitable place for a cozy picnic. 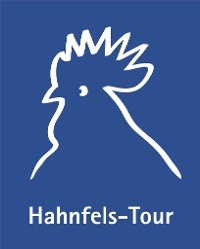 The new Premiumweg Hahnfels-Tour starts at the Belmontplatz in Erfweiler. After climbing up the Hahnberg with the Hahnfelsen we have a fantastic view over the Wasgau. Here is the ideal place for a picnic. 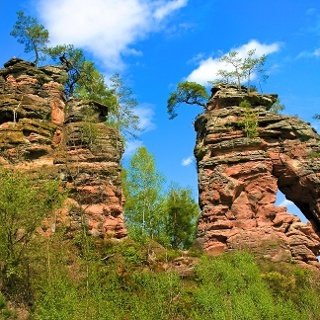 The bizarre Schafstein rock along which the trail passes, is very popular with climbers. On the top of the Panorama Kahlenberg there is yet another impressive view of the Castle Alt-Dahn, the next stop on this tour. 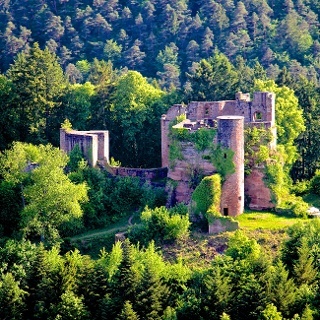 This castle is the largest ancient castle in the Palatinate and just has to be explored. After the walk towards Erfweiler and through the Langenthal it starts to get romantic. Enjoying nature is the motto here. Refreshing spring water and a waterfall make weary travellers fit again for the last leg back to the starting point. The starting point of this new premium trail "Hahnenfels-Tour" is the Belmontplatz (village square) in the middle of Erfweiler. From here, the trail leads past the church up a stepway and then along a path up to the Hahnberg with its Hahnenfelsen. 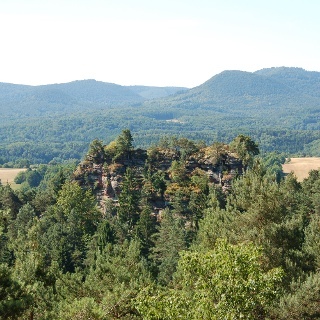 On the Hahnfelsen, you have a wonderful viewpoint which offers a magnificent view of Erfweiler and the Wasgau. It is also the ideal site to relax and perhaps even enjoy a picnic. The trail then leads to the Glastalblick and down into the Bärenbrunnertal. Passing the almost hidden Heegerturm we continue to the source of the Breitenbach with its resting area and fresh spring water. 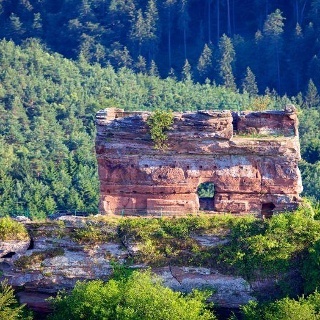 From the source, it goes up to the Schafsteinfelsen, a bizarre rock formation of red sandstone, where the traces of nature can be clearly seen. Of particular interest for climbers. 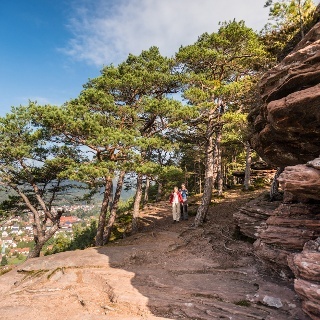 Past the rock formation, the path leads up to the panoramic Kahlenberg with a great view of the castle of Alt Dahn . The trail continues along the ridge, towards the neighbouring village of Schindhard , to the Wasgaublick. Here you will find a vantage point inviting you to linger and enjoy the views over Schindhard, Dahn-Reichenbach and the ruins of the Drachenfels near Busenberg. After a little rest we take a path downhill to the Schindharder sports ground. From here, the trail leads to the Fischwoogmühle and past an old brick kiln over the K 39 uphill to the castle of "Alt-Dahn". 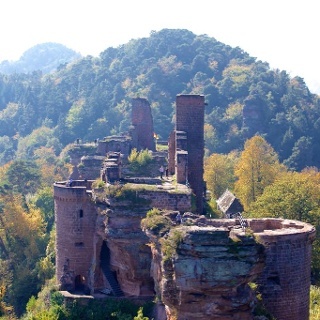 These three castle ruins represent the largest castle ruins in the Palatinate together with a small but fine castle museum. A visit to the castle is worthwhile, in any case. Below the castle ruins, a small castle tavern, set in the shade of old trees, invites you to enjoy a refreshment . The route continues over the Löffelfelsen, again with a view over Erfweiler and then back towards the Wasgaugemeinde. Slightly downhill, the narrow path leads past a secluded cave on the Zimmerberg. Below the Zimmerfels, it then runs down to the Dorfblick and the Heberfelsen. From here it is possible to shorten the tour via the Friedhofstraße and return to the starting point (village tavern: Jägerhof in the centre of Erfweiler). For those of you who do not want to shorten the walk, you can walk around the outskirts of Erfweiler through the adjacent forest in the direction of the Kneipp facilities and from there to the Kohlenmeilerplatz, with its shelter. The tour now runs along a level road through Langenthal towards the Landschaftsweiher, here there are several seating areas to dangle your soul and relax and just enjoy nature. Continue then along the “Liebespfad” to the source of the Eibquelle. This rock spring offers fresh spring water and the opportunity to have a rest. From the source, the path goes to the Erfweilerer waterfall. Again, pure nature. Over the Dickkopfpfad the final leg of the tour leads back to the village, which is reached after passing the Michaelkapellchen. From here, you go along the pavement, past the “Hotel Kleine Blume" (Refreshments available on a beautiful terrace) and back to the starting point of the tour. B10 to the exit Hinterweidenthal, continue on the B427 to Dahn, via Schulstraße, Hauensteiner Straße and K 39 to Erfweiler. Wirklich ein sehr schöner Weg. Die Steigungen sind nicht auf den ganzen Weg verteilt. So hat man (im Uhrzeigersinn) in der ersten Hälfte der Strecke alle Steigungen schon bewältigt. Ab der Burg Altdahn gestaltet sich somit der Weg als schönes Auslaufen. Gegen Ende läuft man eine kleine Schleife um Erfweiler und kommt an einem schönen kleinen Wasserfall vorbei! Auch Klettersteige finden sich unterwegs! Eine sehr schöne, abwechslungsreiche Wanderung. Typisch Pfälzerwald, geht es immer wieder scharf bergauf, bergab. 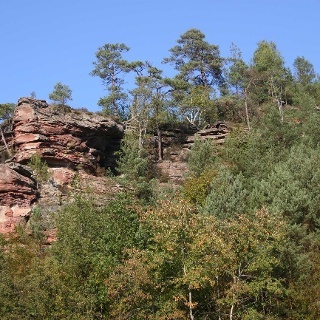 Sind es es im ersten Teil aussichtsreiche Felsen und Berggrate und schmale nadelweiche Pfade, überraschst der zweite Teil mit romantischer Tallandschaft und einem hübschen Woog. Besonders schön, die Eibachquelle und kurios der "Wasserfall" am Talschluss, eigentlich ein Rinnsal das über eine schräge Felsfläche zu Tale tröpfelt. Alles in Allem eine lohnende Runde. Mein Tipp, nicht an sonnenheißen Sommertagen machen. Die Fichtenwälder sind gute Wärmespeicher.